Goldflame HoneysuckleSemi-evergreen vine. Fast growing. Needs support structure to climb on. Bluish/..
Goldflame HoneysuckleSemi-evergreen vine. Already trained to grow on a trellis. Fast growing. Needs .. Giant Burmese HoneysuckleEvergreen vine. 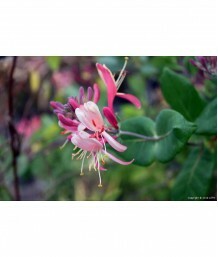 Fast growing upright growth with support, but does not fast..
CA Native Pink HoneysuckleSemi-evergreen vine. Green foliage contrasts with pretty pink flowers. Blo..
Japanese HoneysuckleSemi-evergreen vine. Oval deep green leaves contrast with sweet-scented white an..
Japanese HoneysuckleSemi-evergreen vine. Very fast growing. Oval, dark-green leaves. Sweetly scented..
Japanese HoneysuckleSemi-evergreen vine. Already trained to grow on a trellis. Very fast growing. Ov..
Japanese HoneysuckleDeciduous vine. Green foliage with tinted purple undersides contrast with fragra..
Japanese HoneysuckleDeciduous vine. Already trained to grow on a trellis. Green foliage with tinted ..
Common HoneysuckleDeciduous vine. Fast growth. Twining habit and needs to be tied to a support to en..
HoneysuckleEvergreen shrub. Compact habit. Vibrant flowers are white, purple and fragrant. Mild supp..
HoneysuckleDeciduous shrub. Compact habit. Vibrant flowers are dark red, white and fragrant. Mild su..
HoneysuckleDeciduous vine. Soft pale blue-green foliage. Round, flat silvery white flowers appear in..
Trumpet HoneysuckleDeciduous vine. Long blooming season of showy coral-red flower clusters with attr..